Product #1832 | SKU 454 | 0.0 (no ratings yet) Thanks for your rating! 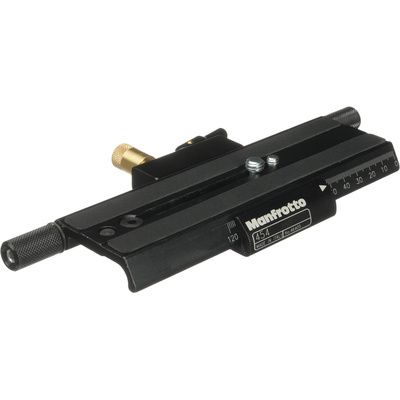 The Manfrotto 454 Micrometric Positioning Sliding Plate is a quick release system that allows for some positioning within the clamp for fore-aft macro adjustments. It is the ideal tool to make precise positioning movements to achieve the perfect framed shot, for macro photography, for QTVR, and other precise copy/repro work. This plate has finger-tip control for ultra-fine positioning, but has a simple lock-release lever for fast set-up. Two plates can be interlocked at 90° for full lateral/forward/back movement (over 120 mm). Made of extruded aluminium, the plate has 1/4"-20 and 3/8" holes and screws for tripod and camera mounting. Replaces old part number 3419.